Successful commercial ventures – whether it’s a new shopping space, residential community, professional building, or corporate campus – view the landscape as an important component of their growth and profitability. Businesses understand that the right landscape can reduce turnover and add to the bottom line. This kind of Next-Level landscaping, or Life-Scaping™, is not a cost, but an investment in your business success. 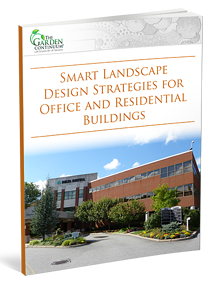 This educational eBook discusses how an expertly installed landscape sets commercial properties apart and attracts buyers. Commercial landscape development projects can be a high-stakes undertaking. With tens or even hundreds of thousands of dollars in potential rental or leasing revenue at stake. An attractive, eye-catching landscape can often make or break a business venture. A tasteful, thoughtfully planned and expertly installed landscape sets high-end residential and commercial properties apart and creates a marketing focal point that attracts discriminating buyers to exclusive communities, campuses, and buildings. Complete this form to download the Landscape Strategies for Office and Residential Buildings eBook instantly!